It is a lifestyle about balancing the mind, body and spirit. In Whole Living classes you will learn about gardening, food, cooking and herbs. You will learn sustainable gardening skills and for those of you who can’t or don’t want to garden you will learn how find and choose healthy properly grown foods. What you eat, when you eat it and where it comes from is essential for good health. You will learn how to choose which foods are best for your individual body type and how to prepare them for optimum health and nutritional benefits. It is so important to learn how to navigate the devious modern day food system and yet obtain quality affordable food. Whole foods are foods that are in their original state with nothing added or taken away. A healthy whole food diet can be omnivorous or vegetarian. Herbs can be our food as well as our medicine. Many herbs are nourishing to our bodies, packed full of vitamins and minerals, as well as some having additional medicinal benefits. These whole foods and herbs are in a natural form that our bodies easily recognize, containing all the nutrients that our bodies need to properly assimilate and use effectively. Keeping our bodies properly nourished is essential for proper cell growth and for our brain chemistry to be balanced. In other words, if we are not eating whole nourishing foods and herbs, we will begin to see dis-ease and unbalanced neurotransmitters that can cause a variety of psychological conditions that include sadness, insomnia, mood swings, depression, inability to concentrate, and compulsive thoughts. You will learn about what is referred to as community herbalism. This is the same knowledge that our ancestors used to keep themselves healthy on a daily basis. Somehow humans have lost taking responsibility for their own health and these herbal skills have faded away. We firmly believe and teach how to use the herbs to support “Daily Wellness” and which herbs to use at the first signs of sickness and/or disease. We do however believe in an integrated medical system where herbs and modern medicines are each used at the appropriate times and ways for better health. In your studies of learning the herbs, we focus primarily on the herbs that we can grow in Virginia. Every class you spend time connecting with the plants and making medicine from them that you will take home to build an herbal apothecary that you can begin to use immediately. This course includes a huge manual which covers class notes, plant profiles, charts, graphs, pictures and recipes for everything we cover in class for you to refer to on your Whole Living journey. Does this class cover gardening and sustainable living? Yes! You will learn about and get to witness sustainable gardening throughout an entire growing season at the farm (April to October). We firmly believe in a term we refer to as “modern sustainability”. The traditional definition of sustainable gardening is a method of growing plants such that the garden is able to successfully sustain itself without requiring many outside resources, pesticides, or herbicides. Sustainable gardening is always organic. Here at Forrest Green Farm we operate as a sustainable farm. For our Whole Living class we choose the words modern sustainability to define a Whole Living plan for gardening that is realistic and doable for people who have to work, have a social life and other modern obligations of our times and can not commit to be full time farmers. Modern sustainability varies from person to person based on their time and space available. Everyone can garden on some level from containers on the deck to acres of land or even renting space in a community garden plot. We teach only organic gardening methods without pesticides. In fact we teach how to use herbs as natural insecticides, food and fertilizers for your garden. 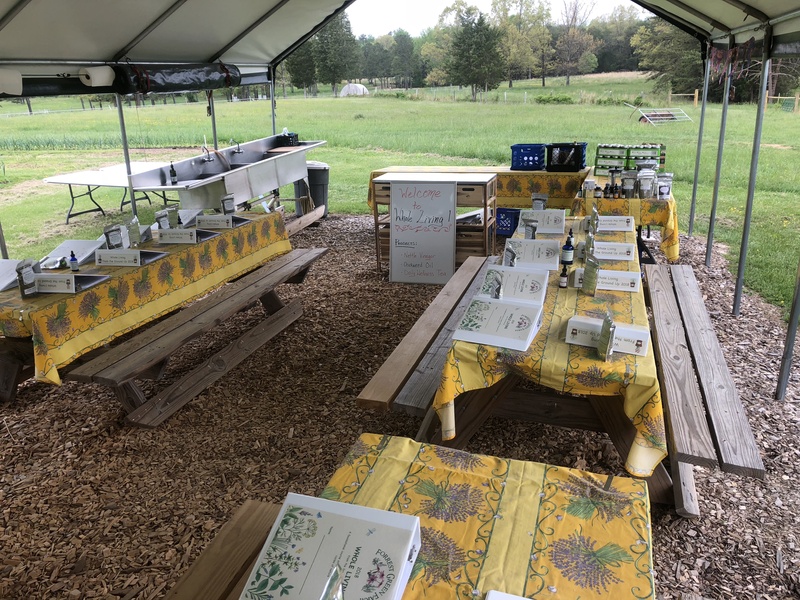 You will learn all about soil, seeding, integrated pest management, companion planting, composting, container gardening, creating instant beds, gardening on large acreage, biointensive planting, cover crops, natural mulches, crop rotation and more. Each person can determine the level of gardening that will work for their personal situation. What is different about your Whole Living course vs. other herbal courses? Just learning and using herbs does not make one healthy. We firmly believe health begins with food, herbs and a healthy lifestyle. The Whole Living course is aimed at being sure you understand and have the tools to make this transition happen. Whole Living class takes place on a working farm during an entire growing season. Everything you learn in class is happening on the farm. That allows you to see everything hands on. Such as growing the vegetables and herbs, greenhouse growing, plant production & processing and raising animals. The course is set up to be very hands on with individual mentoring from Rob, Krista and Skyler. It starts with learning about soil & seeding and in class you will grow your own flat of plants so you will obtain growing experience and plants to get started with for your gardens or containers. Each person sets up their own vermicomposting bin that you will take home and begin to compost your scraps to start making your own fertilizer. Each class you get to go out into the gardens and identify and learn about the growing and medicine from these plants. Then you will make medicine from those fresh plants rather than ordering in dried herbs and not really connecting with those herbs. Each class you will take the medicine projects home with you to build your apothecary. You will also learn about nutrition, how to properly prepare foods and seasonal eating. You will get a chance to sample seasonal foods and be given the recipes so you can continue to make them at home. This program is designed as a step by step hands on program that guides you through making all of these changes in a realistic and affordable way for the busy person. Our feedback from previous classes is that we are successful in helping people create a Whole Living lifestyle that makes them feel better and more empowered. We strongly feel that what sets us apart from other programs is the hands on learning at the farm, the 60+ projects that you take home, the detailed course manual and that you get individual mentorship from us basically for as long are you need it. What we have created with this program is a Whole Living community. For 12 classes you will be with the same group of people connecting, bonding and learning about Whole Living. We also have a closed Facebook group for all current and previous Whole Living classes where we share what we are doing, ask each other questions and post interesting articles & recipes related to a Whole Living lifestyle. It creates support, a chance to continue learning and motivation even once class is over. Do I really take home over 60 projects? Yes, Whole Living is very much a hands-on class! You will make and take home everything from tinctures, oils, vinegars, salves, a 72 cell seeding tray, and much more. You make/take an average of 5 projects home a class. What we make hands on may vary slightly from year to year due to what is available in the herb and vegetable gardens that year. This is a list of projects from one summer of Whole Living year 1. What herbs will I learn in Whole Living 1? In Whole Living 1 you will learn over a 100+ herbs! In your course manual you will receive monographs, growing, drying, and recipe sheets for all of the herbs listed. Where does Whole Living class take place? Whole Living class takes place under an outside pavilion tent at Forrest Green Farm. Whole Living is an outside class, the tent provides plenty of shade and shelter but we will do garden walks and projects outside of the tent also. 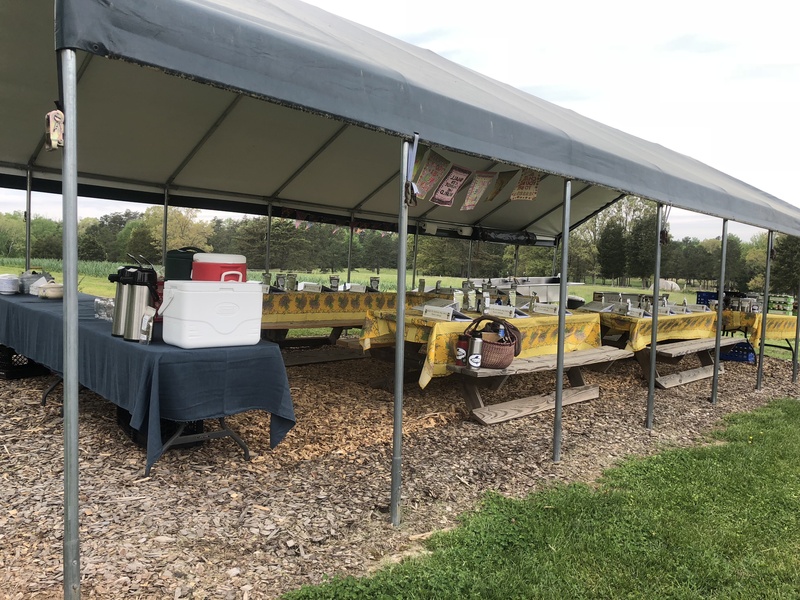 The tent has a picturesque view of the gardens, fields, farm animals and the surrounding Blue Ridge mountains. There is also a porta potty near the tent. We have an outside sink and stove set-up under the tent for class convenience. Class will be held rain or shine, if there is extreme weather we have make up dates scheduled. Can I sign up for just a couple of the Whole Living sessions? No, Whole Living class is a course that builds upon itself. A lot of the learning correlates to other information that you will learn at different times throughout the season. It is a 6 month course that meets for 12 classes from April-October. You should be committed to coming to class and learning. Herbal medicine is medicine and if you want to learn it then we found that the commitment of consecutive classes is the safest way to be sure that you get to know the herbs, understand them and use them safely. What if I have to miss a Whole Living class? Don’t worry! You will still receive all of the handouts and notes from the class you missed and we can go over anything important with you to make sure you are all caught up. You can also ask a person from class to become your Herbal Buddy so that if either of you miss class the other person can make your projects for you. I am a newbie at gardening and herbalism, would Whole Living be the right course for me? Yes, the full name of Whole Living class is Whole Living From the Ground Up and we mean it! Even if you have no previous experience in gardening or herbalism you will not be lost. We start the class with basic information and build on that throughout the rest of the season. We are also always here for individual mentorship and to answer any questions you might have. I have taken other herbal & gardening classes, will I learn anything new in this class? Even if you are experienced with herbs and gardening, whether you have taken other classes or have done a lot of your own research, there is always something new to learn! The hands on projects, food as medicine and nutritional information you will learn in this class is different than many of the other herb classes around. We really focus in on herbs that can be grown in Virginia and gardening for our unique VA climate. We often joke with the class as we share stories of our gardening mishaps that they are learning from all of our mistakes. You will be able to put your knowledge of the herbs into a hands on application by actually making projects for you to use for “Daily Wellness” and at the first signs of sickness. It is a great way to put your intellectual knowledge into practical use. Who teaches Whole Living class? The Rahm family teaches the Whole Living classes. The Rahm’s have been living the modern sustainable Whole Living lifestyle for the 27 years they have owned Forrest Green Farm. For the past 12 years, Rob & Krista have a made a full-time living from farming and creating herbal products. Krista has been gardening for her whole life. She holds bachelors degree in marketing from Marymount University. When she and Rob purchased Forrest Green Farm the decision was made that she would be a stay at home mom to homeschool their children (Dylan & Shanah) and keep them close to nature. So it was absolutely necessary for her to grow and preserve their own food to cut costs. Over time this type of lifestyle and sustainability began to make so much sense to them. Eventually, Krista added in herbal studies to enhance the health of her family. She has studied with many wonderful herbal teachers & mentors and continues to take herbal and nutritional classes, as it is her life’s obsession! Rob has a bachelors degree in mechanical engineering from Rochester Institute of Technology. He worked as an engineer for many years to support the family until they decided to start farming full-time. Rob uses his skills to build greenhouses, keep equipment running, raise the animals and grow the vegetable gardens. Skyler has been working on the farm since 2014. In 2017, she married Dylan and became a full-fledged Rahm family member. Sky maintains the herbal product production, inventories, wholesale accounts and whatever else is needed. Sky has always been a part of the Whole Living classes and is now the full time assistant and co-teacher for the classes. Sky specializes in Flower Essences and produces her own line of Essences for Forrest Green Farm. Does the class cover animal processing? No, we do not cover processing/butchering animals in Whole Living class. We do a study of pasture raising animals in our classes to help you understand the benefits and what to look for when seeking pasture raised animals foods. However, we do offer to any Whole Living class participants who wish to learn processing to join us on a chicken processing day and we will teach you all about it, hand on if desired. This is totally optional and just an added service, if you want to learn about animal processing.